Monsoon is in full swing – that long awaited season of the year which brings about pleasure hitting back the heat of the summers and letting the earth quench its thirst for the rain. Rains, muddy puddles, mosquitoes and illnesses – the entire excitement of the most awaited season settles down. 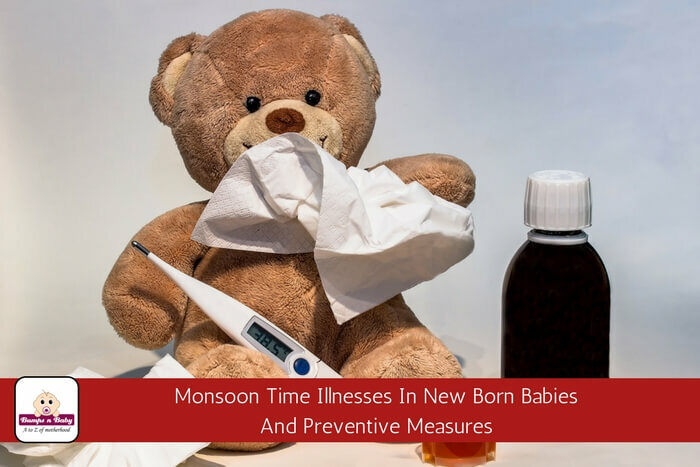 In a situation like such, parents become concerned about how to take precautionary measures against the major monsoon time illnesses in newborn babies and kids. This article will give you an idea about all your concerns related to monsoon borne diseases and illnesses and ways to prevent them. Not only among infants, but malaria is a commonly heard disease in every age group during monsoon. It is spread by mosquitoes (Anopheles) which easily find their breeding grounds in standing waters during this season. In newborns, malaria can be congenital malaria or acquired neonatal malaria. Congenital malaria is transmitted from malaria affected mother to her newborn either during delivery or just before delivery through the placenta. The other is malaria developed due to an infected mosquito bite. Malaria in infants can come without any symptoms or can mimic symptoms of other diseases like sepsis. So for kids under 6 months it is a bit tricky to find out if its malaria or not by seeing just the symptoms. If your area is malaria prone always take your child to the doctor if you see any of the below symptoms to rule out any chances of malaria. Always use a mosquito net/bedding every time possible. Make use of natural vector repellents be it jet, machine, spray, gel etc. to keep at bay from allergic reactions. Repellents that can be used on clothes are a great option as they won’t come in direct contact with the baby’s delicate skin. 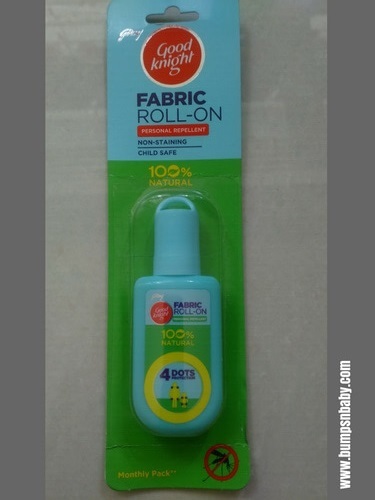 Good knight Fabric Roll-On is one such product you can safely use and is easily available too. Cover the baby with full sleeve and full leg clothing. Dengue is the commonly spread and life threatening vector borne disease in the monsoon season. 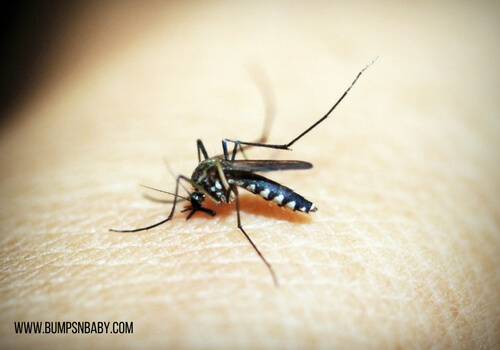 It happens when an infected mosquito bites, the virus gets injected into the bloodstream. Using mosquito net around the bed prevents mosquitoes from entering inside our sleeping zone. Use mosquito repellents like Good knight Fabric Roll-On. Just 4 dots of this 100% natural mosquito repellent on your baby’s dress, cot, pram or stroller is enough to keep mosquitoes away from your kid. As it is made with natural oils like citronella and eucalyptus oil and not applied directly on skin, it is safe for babies above 2 months of age. Babies are susceptible to stomach flu during the rainy season. One common reason for stomach flu in babies is Rotavirus. The virus that is spread from the food poisoning bacteria. Both parents and the care takers should exercise hygiene by keeping their hands clean after activities that include the use of washrooms, changing diapers, dusting, vacuuming, looking after pets etc. Offering frequent breastfeeding helps the baby keep at bay from gastroentitical troubles. Always invest in a good mosquito repellent ideal for babies like Good knight Fabric Roll-On or even Good knight Patches. These are completely natural & not applied on the skin. What were the preventive steps and measures you have/had taken against these monsoon time illnesses in newborn babies and kids? Some of the very common symptoms that I see in most of the newborn babies. I loved the way you have presented some tips to prevent the disease and keep your newborn baby healthy. Thanks, Sangeetha for the article. I am doing a project on mother’s decision making process for buying skincare products (such as moisturiser, soap etc.) for infants. I wanted to ask what are the triggers which affect a mother’s decision while buying? I guess mostly it would be suggestions given by friends or elders (mothers and mother in laws) and pediatricians. But what do you look for in the product while buying it?